Eryngium yuccifolium is a great one for the dry flower arrangers and works as well as a fresh cut flower. Eryngium yuccifolium has gray leaves reminiscent of a grass or yucca. The Button Eryngo grows flower spikes three to four feet tall and gradually spreads forming a loose cluster of plants. So far Eryngium yuccifolium has not been bothered by the gophers, the cold weather or the errant mower. Plants don't transplant well. Eryngiun yuccifolium gets by on dry to moderately moist soils and grows best in full sun. Our plants have gone completely dormant each Winter. Eryngium yuccifolium blooms through the Summer with the flowers drying into the Fall. 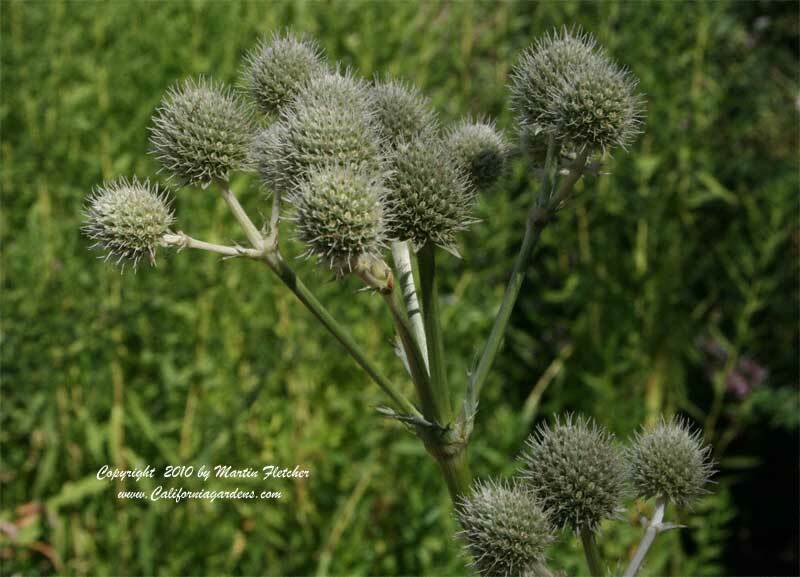 Eryngium yuccifolium is native grasslands of the Eastern US and is Winter hardy to zone 3. Eryngium yuccifolium attracts the Painted Lady, Gray Hairstreak and Common Buckeye with its nectar and is a nice addition to the butterfly garden. White thistlelike flowers of Eryngium yuccifolium known as Button Eryngo or Rattlesnake Master. High resolution photos are part of our garden image collection.